SUBHEAD: Navy expands domestic war games, despite public concern over their legalities. 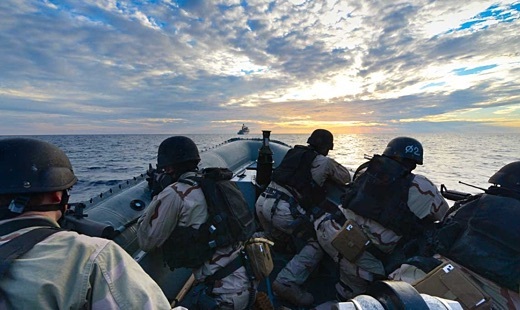 Image above: Marines on a rigid hull inflatable boat used for special operations infiltration, extraction and maritime interdiction missions. From (http://www.military.com/equipment/rigid-hull-inflatable-boat). In an act of ongoing domestic military expansion, the US Navy is disregarding federal and state laws that require it to adhere to consultations with state historic and archeological preservation groups during the run-up to its war games across western Washington State. The Navy's recent action on November 6, which many are now referring to as "going rogue," also comes on the heels of the Navy producing an environmental impact statement in October in preparation for war gaming on Washington State's Olympic Peninsula without finishing required consultations with the US Fish and Wildlife Service or the National Marine Fisheries Service. Under Section 106 of the US National Historic Preservation Act, the Navy is required to consult with Washington's Department of Archaeology and Historic Preservation before getting final clearance to begin its war games. The Navy claims that it has complied with the requirements set forth in the statute and regulations, but that department has stated that they have not yet granted the Navy permission, and it made its objections to the Navy's actions available to the public to read. The department's letter to the Navy also addressed the Navy's abrupt termination of its consultations with the state. The very next day, on November 7, the Navy rejected a request made in Anchorage, Alaska, by Dr. Rick Steiner, a marine conservation biologist and board member of Public Employees for Environmental Responsibility, who was asking for environmental details of its June 2015 "Northern Edge" (NE15) training exercises in the Gulf of Alaska. The Navy notified Steiner that it is withholding most of the requested information under a "national defense" exemption. In response, Steiner appealed the denial to the Navy's judge advocate general (JAG) in Washington, DC. "I think they wish to deceive the public into believing that the impacts of their offshore war games are less than they actually are," Steiner told Truthout, responding to a question about why he thinks the Navy is withholding this information. Whether it is circumventing laws and processes or withholding information about how its war games impact the environment - information that should be public - the Navy has established a pattern of bellicose actions, and the outcry against it is intensifying. Steiner, who has worked in Alaskan waters for more than 40 years, told Truthout that he learned last spring via a Freedom of Information Act (FOIA) request that the Navy intended to detonate dozens of high-explosive charges (with 8.8 pounds of explosive), which produce an acoustic impact similar to a 500-pound bomb, among other deleterious environmental impacts. "Then, the Navy boys came up here to Alaska for a good old-fashioned shoot'em-up war game and submarine hide-and-seek, declined our request for independent onboard observers to assure compliance with their environmental mitigation plan, and when they finally did respond months later, redacted and declined to produce any significant information subsequently that may cast the affair in a bad light," Steiner told Truthout. "They also have denied our repeated requests that they conduct such war games in winter and further offshore, to avoid impacts and risks to migratory marine mammals, seabirds and fish in Alaska waters in summer. The Navy is a stubborn bunch, to be sure." The Navy's recent response to Steiner's additional FOIA request revealed how, during the naval war games last summer, a whale surfaced a mere 100 yards from an active sonar source ship. "That a whale was this close to a 235-decibel mid-frequency active sonar source gives concern that the whale could have been seriously injured or even killed," said Steiner, who studies whales. "In addition, they planned to use hundreds of rounds of ammunition, but will not tell us what they did use." Steiner also expressed concern that the Navy personnel tasked with monitoring the seas for whales and other marine mammals that could be injured or killed were unable to even identify the species of a whale with which they came within 100 yards, despite having a full minute of observation time. He also worries about the Navy's ongoing lack of transparency around the environmental impacts of its exercises. "They have not been at all transparent and open," he said. "I began asking for information on NE15 in April, and they were dishonest with some of their responses (for example, that no in-water explosives would be used, when indeed there were many)." After the NE15 war games concluded, Steiner submitted another FOIA request seeking information about sonar use, ordnance use and marine impacts. "They used their conventional 'axis of obfuscation' - bouncing the request between San Diego, Washington, DC, Honolulu, then back to San Diego - in order to delay any response until last Friday, over four months later," he said. At that point, the Navy continued in the same opaque vein: The documents they produced were almost entirely redacted. The Navy again claimed a "national defense" exemption. However, Steiner suspects the real reason is that the Navy used potentially damaging sonar "far longer and perhaps closer to shore, with correspondingly greater impact" than they had previously admitted. "Obviously, the Navy does not wish to be transparent on what it is doing in its training activities in our public waters," Steiner said. "While the Navy has need for secrecy in many of its missions, the war games in Alaska is not such a mission." Image above: A US Navy EA-18G Growler aircraft, assigned to "Electronic Attack Squadron" 132, flies over the Gulf of Alaska as a part of the Northern Edge training mission on June 22, 2015. Photo by US Pacific Fleet. Karen Sullivan worked for the US Fish and Wildlife Service's Division of Endangered Species and External Affairs for 15 and a half years. She spent the last seven years as assistant regional director for external affairs, which covered all media and congressional interaction and correspondence, plus outreach, publications and tribal grants for the Alaska region. Hence, Sullivan is an expert in the bureaucratic procedures the Navy is supposed to be following. She is now part of the West Coast Action Alliance, one of two large multistate and international citizen groups that have tasked themselves with watchdogging the Navy, due to what they believe are ongoing violations of the law, blatant acts of disrespect toward human and environmental health, and ongoing bellicose behavior by the military branch. Sullivan told Truthout she believes the Navy's final environmental impact statement about its upcoming warfare training is "unlawful and fatally flawed." 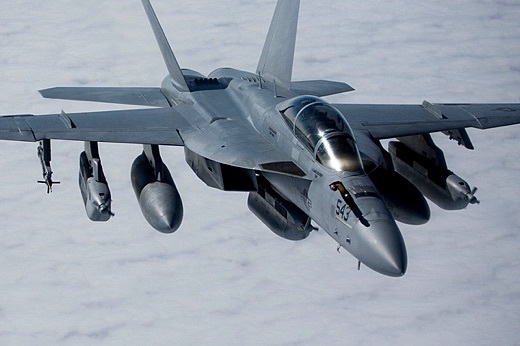 Dozens of naval EA-18G Growler supersonic jet warplanes will fly as low as 1,200 feet above the ground in some areas in order to conduct war games with 14 mobile emitters on the ground in national forests. Medical doctors, scientific reports and even the Navy's own documents show that enough electromagnetic radiation will be emitted to be capable of damaging human eye tissue, causing breast cancer and childhood leukemia, and damaging human fetuses, in addition to impacting wildlife in the area. Medical doctors also told Truthout that noise from the Navy's jets is a major health risk. The Navy has denied that these serious medical impacts will occur. Sullivan's group has chronicled several recent events she feels also demonstrate the Navy's cavalier and aggressive attitude toward public concern over its ongoing activities. In August, her group submitted an open letter to the Navy requesting that it fix the noise complaint hotline, "stop the horrendously disruptive low jet swoops over communities" and "[give] the public a subscription service so we can learn about comment periods before they're half over." The following month the Navy went on to release a 4,000-page environmental impact statement that did not even include a public comment period, which it is required by federal law to provide. "This is unprecedented behavior for the Navy in all of its activities in the Atlantic, Gulf of Mexico and elsewhere in the Pacific," Sullivan told Truthout. In regards to the Navy's most recent action of terminating its consultations with the State of Washington over impacts their war games would have, Sullivan said, "Basically what happened is the Navy refused to give [the state agency the information it needed], so the state ran out of time and the Navy simply declared themselves compliant and told the state to buzz off." "We Don't Have to Do Anything About It." Sullivan told Truthout she felt the Navy is continuing to send the same message to the public about concerns around the environmental and economic impacts of the war games in the areas where they are conducted. "Their [the Navy's] message was put best by Northwest Training and Testing Range Manager Kent Mathes at a public meeting after I asked him, 'Isn't any of this public concern going to change anything?'" Sullivan said. "He said, and I quote, 'We're here to listen to what they have to say, but we don't have to do anything about it,'" she said. A recent missile test by the Navy off the coast of southern California caused alarm and anger across Los Angeles, in part because the public was not warned about it in advance. Events like this, coupled with constant complaints of jet noise around naval air installations around the country, are becoming increasingly common. Another example of apparent disregard by the Navy toward public concern can be seen in their response to a recent FOIA filing. Public Employees for Environmental Responsibility issued a press release in early November titled "US Navy withholds details of 2015 'Northern Edge' training exercise in Gulf of Alaska" that made it clear what information was requested from the Navy, including "information on active sonar used (frequencies, pressure levels, and duration) and live ordnance used during NE15, as well as encounters and mitigation measures used to protect marine mammals." The press released noted that Navy sonar exercises are known to be damaging, even lethal, to acoustically sensitive marine organisms, particularly whales and dolphins. "Details of the sonar use, effects, and High Explosive ordnance used in NE15 was requested and should clearly be made public, but instead were withheld," the press release stated. Instead of providing the requested information, the Navy released 253 pages of ship's logs and communications from their exercises, but even this information was heavily redacted. Steiner believes that the Navy's behavior has become "an old, habitual behavior, almost a default position. They are the Navy, and they don't have to be transparent with we the people, or so they think." His statement is backed by many examples, including how the Navy has consistently failed to adequately inform the public of open comment periods, and also failed to take comments and amend its plans according to public concerns. "They find it more convenient to keep everything secret, to avoid potentially damaging public scrutiny of its war games," he said. "Additionally, they wish to keep the public in the dark about all of this, so as to assure the approval of the upcoming Supplemental EIS [environmental impact statement] for their future five-year plan for war games in the Gulf [of Alaska]." So, what needs to happen? Steiner feels the Navy needs to move its war games in Alaska waters to winter months and move the exercises further offshore in order to avoid risks to migratory marine wildlife, which includes whales, seabirds and salmon. He also believes the Navy must permit independent and competent onboard observers during its exercises, in addition to conducting better monitoring of its actual environmental and ecological impacts itself. Steiner also sees the Navy's actions as a hindrance to what the Navy hopes to achieve, which is public support and acceptance of its ongoing domestic war game activities. "Given this level of secrecy, the Navy is going to have a hard time convincing Alaskans that the environmental impacts of its future training activities in the Gulf of Alaska will be as benign as it asserts," Steiner said. "This lack of transparency and inadequate monitoring underscores the critical need for independent observers onboard any future training exercises. The Navy can rest assured that, given this level of secrecy, they are going to have a harder time gaining public acceptance - their 'social license to operate' - in Alaska in the future." Meanwhile, the Navy has plans to continue its trainings in the Gulf of Alaska and beyond. Thus, Steiner thinks the next reasonable response is to continue appealing to higher levels of government. "We intend to ask for a congressional hearing and a GAO [Government Accountability Office] investigation regarding the military's training activities, including environmental and social impacts of such," he said. "These problems seem to be multiplying, citizen concerns are growing and there needs to be some congressional oversight of all of this." Some people in the military or military supporters claim that Steiner's pushback against the impacts of military training and war games is "unpatriotic." He disagrees. "About concerns often expressed regarding the patriotism of our efforts to reduce the deleterious impacts of military training activities, there is nothing more quintessentially patriotic than seeking to enforce the laws of the US, seeking open and transparent government, and holding our government accountable to we the people," Steiner said. At the time of publishing, Truthout has not received a response to its request for comment from the Navy. Tulsi Gabbarb seeking information on Navy methods of protecting Hawaii's environment. Even if RIMPAC didn't harm wildlife or the environment these war games are pointless. It's not like this has not happened here before. The Navy washes off the blood and wears white. The unseen wars on the Pacific Ocean lead by the United States Navy is cranking up this summer. RIMPAC is only a small piece of a huge, systemized federal project of destruction in the Pacific. If you think that RIMPAC 2014 will be anything but harmful to Hawaii you are delusional. The modern PMRF is the spawn of thermonuclear tests conducted on Johnson Island in 1962. The history of RIMPAC will be more of the same. Destruction to life in the Pacific Ocean. Excuse us while we turn the Pacific Ocean into a radioactive ashtray. It's a feeble attempt by USA to outplay Asia in the game of who can destroy the planet the fastest. Pacific Rim countries led by the US Navy take part in exercises in death and destruction in our ocean. GE salmon - What could go wrong? Are resource wars our future? Pacfic islanders against US "Pivot"